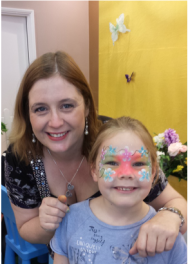 Hi, My name is Helen Kuijpers and in May 2012 I set up Little Munchkins Face Painting and have been happily painting at events and private parties since then. In January 2013 I trained at the London School Of Face Painting which I absolutely loved and learnt so much as a result. I have worked for many parents in the Berkshire area at birthday parties. I have also worked for many companies including Parkway Shopping Centre, Newbury NCT, Thatcham County Council, Forterra and Newbury Fire Station. In 2017 I painted at the finale of the Great British Bake Off as well. I love seeing the reaction on the children's faces when they see their designs and feel lucky to do a job I love! All of the images used on this website are the sole property of Little Munchkins Facepainting and cannot be reused without written permission from the artist. © Helen Kuijpers 2011.